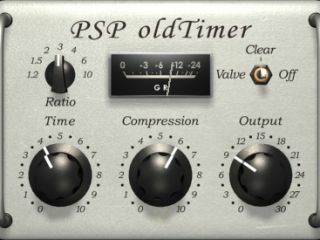 PSP Audioware knows a thing or two about producing software that gives your music a 'classic' sound - its Vintage Warmer recently topped MusicRadar's list of plug-ins you can't live without - and now the company has released a vintage-style compressor in the shape of oldTimer. This is designed for track and program compression and limiting, and is said to provide a "simple compressor that offers an exceptional musical sound while requiring a minimum of tweaking". Rather than being a straight emulation of one compressor, oldTimer is said to emulate the characteristics of several models. It can work smoothly and softly, though PSP also says that "it may slightly colour the sound with its tube emulation on transients when heavily driven internally by high compression values". oldTimer operates as a VST, AU or RTAS plug-in and runs on Mac and PC. Its full price is $99, though if you buy it before 12 August it'll only cost you $59, and from 12-21 August it'll only be $79. A demo is also available.